Perhaps modern gaming’s most established franchise, Call of Duty has come under increased scrutiny in recent years as its blockbuster reputation has been hampered by gamers’ understandable concerns that while the series churns out new titles every year, with the first Tuesday in November almost becoming Call of Duty day, the franchise formula changes very little. Advanced Warfare does change things up in the biggest way since Modern Warfare 2, with developer Sledgehammer Games making their solo debut with the franchise. The new exo-suit gives a new degree of movement to players’ characters that changes the way that games should be approached. However, in saying that it still maintains many of the traits that Call of Duty has become known for, both good and bad. In the words of Modern Warfare 2 villain General Shepherd, “The more things change, the more they stay the same”. Taking the line that the last three Call of Duties have taken, Advanced Warfare has a futuristic setting – although with this one being set even further forward in 2054. It is a time where technology has driven warfare to new levels, with more intelligent drones and weapons taking over the industry. The game looks great, although I am playing it on last-gen hardware, and takes a relatively colourful palette and combines it with the colder and generic feel of the future very well. The biggest change in this Call of Duty though is the exo-suit, which allows soldiers far more options in terms of movement – with the ability to boost into the air, slow landings and move around far more freely. I’m keeping this review confined to the multiplayer element of the game, as I haven’t played enough of the campaign or the Exo Survival co-operative game mode to give a fair judgement on their merits. From what I’ve played of each they seem as though they are boiler-plate Call of Duty fare, but with little to no imagination or memorable elements to them. 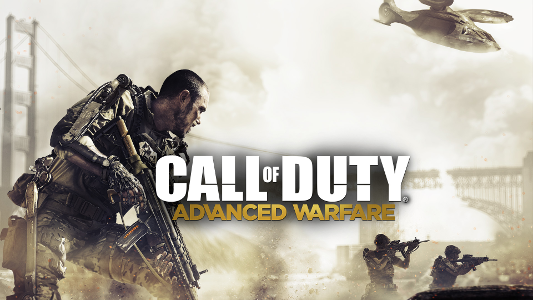 The campaign mimics Black Ops 2‘s general ethos to an extent, with warfare being a changed beast from the modern day and the Exo Survival game mode takes a heavy line of Modern Warfare 3‘s survival attempt – which essentially revolved around putting AI enemies against players on multiplayer maps, and no real objective other than to stay alive. But the multiplayer is where Call of Duty games really earn their reputation anyway, and there is plenty in this game that tries to evolve the franchise into new territory. The exo-suit changes multiplayer considerably by adding a new level of verticality to gameplay. It manages to heighten the signature fast-paced gameplay of Call of Duty as relatively large maps can be traversed quickly and your next encounter is rarely more than a few seconds away. Coupled with the fast rate of fire of guns, and the relatively solid hit detection, it makes for a game that has two positives combine to make a lethal combination for players that are new (or returning) to the game. One second you will be safe, and the next minute you could be dead – such is the nature of the beast. It’s something that takes a while of getting used to, but it can be done. Much has been made of Advanced Warfare‘s exo-suit capabilities, and comparisons between it and this generation’s other jetpack shooter Titanfall have been very common. After playing both, there is little real similarity between the two systems – other than the fact they allow you to boost into the air (which AW gives more weight to). Titanfall‘s system is far more fluid and intuitive, with the added bonus of wall-running making its’ movement far better – but Advanced Warfare‘s does allow you to customise your exo-suit in more ways and does a good job of bringing a new flavour to the annual Call of Duty banquet. The exo-suit’s abilities give you special features such as a temporary shield, speed boost or a trophy system which destroys incoming explosives – all of which can come in tremendously useful, but are forgotten slightly in the heat of Call of Duty combat. The game has a reasonable set of maps, which generally feel about the right size for the six on six contests that Advanced Warfare serves up. None really stand out to me as being especially great, although there are definitely some that are better than others. One problem I’ve had with many of them is that they don’t seem to have been as optimised for the exo-suit gameplay as they could have been, with many areas being “out of bounds”, areas being accessible through glitches and holes being included in the map that let you fall off to your death. None of these features strike me as good map design, and although in general they are fun and colourful to run around, these create frustration that shouldn’t be there. Most maps also feature random events that occur during the game, which while adding a bit of context and feature to the maps they often only result in an annoyance that gets in the way of the game. Examples range from the tsunami that washes in on Defender or a toxic volcanic explosion on Retreat that ushers you to another half of the map. I can understand the appeal of adding in these sorts of features, but it disrupts the flow of a game so much that it takes away from the overall experience of a match for me. The create-a-class system appears to have been lifted wholesale from Black Ops 2, with the Pick 13 (up from 10) system allowing a very flexible customisation of your loadout to incorporate the guns, attachment, perks, scorestreaks and equipment. The biggest change otherwise is that scorestreaks can now be customised, with each getting new abilities that cost more to earn but provide more effectiveness if you manage to attain them. This adds a new layer to the rewards, as although there are fewer different scorestreaks available on the face of things – their upgrades act in the way that Pro perks used to. It’s interesting that while the game has chosen to break up perks individually that they have chosen to group scorestreaks together, presumably to focus on the personal combat of the game. The balancing of this system also appears to be very good as there are no real stand-out perks in the game that are over-powered. One necessity for me is “Hard Wired”, which makes you immune to the obnoxious System Hack scorestreak.